Truck drivers have a heightened duty of care to others on the road, and when truck accidents do occur, they typically result in life altering, debilitating, and costly injuries. Fortunately, the law allows accident victims to recover compensation for their injuries and the subsequent damages they cause, such as expensive medical bills, lost wages, costs of rehabilitation, and pain and suffering. Unfortunately, pursuing a truck accident lawsuit is easier said than done, as it requires extensive knowledge of both federal law and trucker regulations and experience in handling personal injury cases. At Olson Law Firm, we have both. 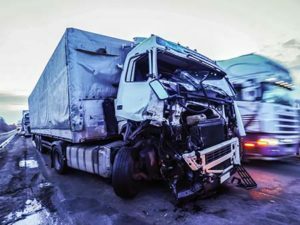 If you or a loved one was injured in a big-rig accident, it is understandable if the last thing you want to think about is fighting a legal battle. Yet, you only have so much time to file your claim before you lose your chance at recovery entirely. In Colorado, that time frame is two years, or three years for accidents involving automobiles. Our truck accident lawyers at Olson Law firm will handle as much of the legal process is possible while you focus on healing. Statute of limitations aside, it is essential that you file a truck accident claim and begin building your case as soon after the accident as possible. Truck accidents are unique in that there may be several parties involved, including the truck driver, the driver’s company, and the manufacturer. The trucking company’s attorneys and insurance company will likely begin building its defense as soon as they hear of the incident. You need to do the same—especially if you wish to preserve crucial evidence. 1. What evidence do I possess that I have the power to preserve? 2. What steps do I need to take to preserve said evidence? 3. What evidence is likely still out there that the defense may possess and is likely to destroy? 4. What measures do I need to take to obtain said evidence and ensure that it is not destroyed? ● Documentation of driver qualifications. The more evidence we have to work with, the better our odds of obtaining a favorable outcome to your truck accident case. Unfortunately, the final four items are in possession of the trucker and his or her company and are not available for injured parties or their attorneys to examine prior to litigation. Moreover, federal law only requires that companies keep these documents for a relatively short period of time. This is yet another reason to hire a knowledgeable truck accident lawyer as soon after your accident as possible. When you retain the help of Olson Law Firm, we will submit a spoliation letter as soon after our retention as possible. This letter puts the other parties on alert that a truck accident lawsuit is possible and that the company and trucker have an obligation to retain certain evidence. If any documentation is destroyed after the letter is received, a presumption arises against the party that destroyed the records that the records would have been negative for that party, and helpful to you. Truck accident cases are unique in so many ways. One major way in which truck accident cases differ from typical automobile accident cases is that the opposing party—the trucking company—has an aggressive team of lawyers and insurance agents on its side, parties that know precisely how to mitigate the impression of fault in a few simple steps. If you try to face the trucker, his or her company, and the company’s team of lawyers on your own, you are unlikely to get very far. The best thing you can do for your case and your future is to retain the help of a truck accident lawyer who is just as aggressive and just as wily as the opposition’s legal team. At the Olson Law Firm, we have those lawyers. To make the most of your truck accident case, contact our team today. We serve accident victims in Denver, CO, and Cheyenne, WY, and surrounding areas.